The holidays are right around the corner. Once we all sit down at the table for Thanksgiving dinner, the celebrations will keep on rolling – right up until New Year’s Day. 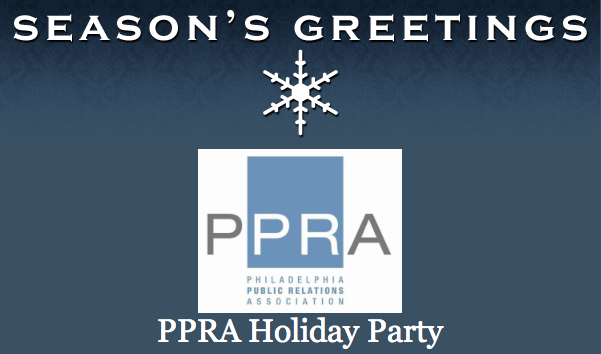 With so many exciting get-togethers coming up, we want to make sure that you don’t miss out on one of PPRA’s biggest events of the year – our annual Holiday Party. This year, the festivities take place at Penn’s View Hotel on December 4. See below for details. We will be collecting items for the Garces Foundation (including Spanish-English dictionaries and American-themed board games) to provide resources to underserved immigrant families who need them the most. Don’t forget, you can arrive in style to Penn’s View with Uber! All new riders can receive up to $20 off their first ride with promo code PPRAHOLIDAY. Plus, bring a donated item to support the Garces Foundation for the chance to win a $25 gift card from Uber or a free entry to an upcoming PPRA Program. This entry was posted in Message for Members and tagged Events, Holiday Party, Holidays, Philadelphia, Philly, PPRA, PR, Public Relations by pprablog. Bookmark the permalink.